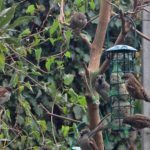 Naturally, food is one of the biggies if you’re looking to increase bird visitor numbers to your garden. At one time, it was widely regarded that we should only feed birds in the winter when natural sources were scarce. However, experts have since revised their opinion and have stated that it is fine to put out food all year long. This is good news because it means you can attract these beautiful creatures every day, but what should you feed them? Wild bird seed mixes, fat balls and peanuts are all available on the high street and can be bought in bulk online, which makes them the simplest choice, but you could also make your own mixes with peanuts, oats, hemp and sunflower seeds. You can also feed table scraps such as veggie peelings, bacon rind and salt free peanut butter, but if you’re unsure whether something is safe to leave out, please do check first. The easiest way to get the food to the birds is by hanging up cylindrical bird feeders in a few choice locations. You could also install a bird table and make a feature out of it. Birds don’t just need food. Like everything else on the planet, they require water. If you put out fresh water, ideally in a sloping bird bath, you will soon see all manner of species flocking to your garden, and you’ll have the joy of watching them, drinking and bathing. Just remember to change the water every day to keep it fresh. Birds need a safe, sheltered space where they can feed and drink so they will check that your garden is safe before they dare to enter. Plant as many shrubs, trees and hedges as you can to give them safe places to rest. Roses, Hawthorne, willow and ivy are all good choices, but there are many more, so you should still be able to create your dream garden and provide for the birds with relative ease. Nest boxes attract so many species that it is worth putting a few up, especially since Spring is round the corner. If you put a few up when getting your garden ready for Spring, you’ll be rewarded with glimpses of brand new chicks when they arrive, and you can guarantee that there will always be birds in your garden. If you and your family fancy building a hide in your garden so you can get a closer look at your garden visitors check out these instructions. Bird watching is a great activity to get your kids outdoors and into the fresh air. If you do have garden furniture that you enjoy using, make sure this space is far enough away from the bird feeding areas so as not to scare them, but in a position where you can easily watch their comings and goings at a safe distance. For more information about how to make your garden more bird and wildlife friendly visit the RSPB website or our instructions on how to create a wildlife pond.